Question: Who died and crowned Katt Williams the official King of Comedy? In all seriousness, when did the culture make a U-turn from laughing at that infamous WorldStar fight video (with a random child, no less) to giving weight to his thoughts and opinions on other people in the entertainment industry? Before we delve into the idiocy of this cheap shot hurled at Tiffany Haddish, I’d like to make it clear that I think he is funny. He’s one of the few comedians who can go away for a while (most often to jail) and come back with a solid piece of work. But that’s where this all stops being funny. 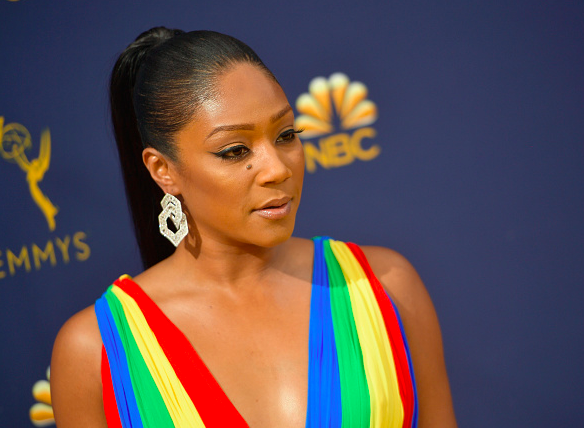 His comments about Tiffany Haddish “not being a real comedian” made last week on Atlanta’s V-103’s Frank and Wanda in the Morning radio show, are just plain harmful. The injury lies within the scope that no matter how high Haddish climbs the ladder of fame, she remains a woman doing it in brown skin in one of the toughest industries. For example, in 2016, out of the 100 top grossing films, 47 did not feature a single Black woman or girl speaking on screen, according to research data from USC Annenberg. The very next year in her big screen debut, Haddish swung the pendulum a bit, shattering records with “Girls Trip” with Regina Hall, Jada Pinkett Smith, and Queen Latifah. At the very least, we’d have to agree that she carried that film and the fact that it was even made in a period where Black women are regularly cast aside is a rare feat. According to Box Office Mojo, the film has grossed $140,376,621 worldwide. Let’s call a spade a spade. Williams is exhibiting the behavior of a person (I won’t say a man because you’ll label me a misandrist) who might not feel too comfortable in his spot. Instead of letting Haddish enjoy her moment, he goes on the attack in a clear and obvious bid to marginalize her lane. She’s encroaching on his fanbase and thus his territory. The sad part for him is that Haddish is just getting started. “Night School,” a film in which she co-stars with Kevin Hart, who has recently defended her standing during a promo stop at Power 105.1’s The Breakfast Club morning show, will land in theaters by the end of the month. But back to his original bone. Google says the definition of a comedian is “an entertainer whose act is designed to make an audience laugh.” I laughed when Haddish reminded me of my crazy girlfriend from college who seemed to keep all the peace in the room. I cried real tears when she went to town on that grapefruit. I hollered at the way she stood up for her friend when she knew her man was living foul. I know I’m not alone. It’s all acting, but Haddish brought something to the film that we haven’t seen in years. She was raw, crazy, loud, and unapologetic. Who gets to say that when you’ve spent X-amount of years building a fanbase and sharpening your craft that you aren’t what you say you are? Answer: Not your ex-boyfriend, not your former boss, and definitely not Katt Williams.